I read/listened to this book 2 months ago. It was pleasant but infinitely forgettable. I can’t remember that much about the plot (other than what is outlined in the blurb above). It was very much a “The one that got away” plotline with the heroine regretting not having her chance at the hero long ago. She makes a decision to sleep with him before she leaves Chicago for a job in New York. There is a whole lot of navel gazing with questions of “should I” , “do I”, “does my career matter or love matter” etc etc. Of course, in the end lurve wins and career opportunities in Chicago over NYC win over the heroine for her perfect life (I am not being snarky here). And here is the spoiler: The grand gesture/love reveal was significant: the hero was the domesticated person in this romance. And the room he prepared for her in their home as a present was not a nursery but a study. I nice little nod symbolising his support of her as a career woman and no HEA baby epilogue for this novel. As audiobooks go, this was a fun listen and the two narrators were pretty good on their own however their pacing differed from each other which grated each time the story transitioned from one character to the other. This was especially noticeable as I listen to audiobooks at a x1.25 speed. The standard speed does my head in as it tends to be too slow. I was interesting to note that this speed reflects a lot about the narrator’s sense of story and pacing as well as production qualities which I am finding that romance fiction audiobooks are nowhere near as well produced as literary fiction (surprise surprise!). In The Wedding Date Bargain, the male narrator varies his pace to such an extent that the x1.25 moves from standard speaking to speedy speed racer necessitating me to stop the audio and change the speed down to a x1.1 just to understand what he is saying. The male narrator also had an overly aggro way of shouting the arguments between the males in the story. Now, he is only enacting what the author wrote, But yeah. Tone done the gruff and angry. Heroes need some chill. 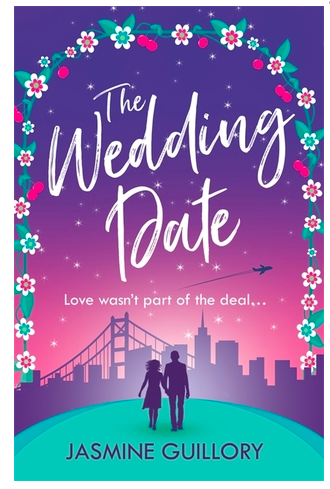 Since 2018 was such a dud year for romance reading for me, I was quite deliberate in searching through recommendations and trying to read beyond the review hype and I felt this book was likely to be good. Nothing like curating your reading choices. Unlike the Wedding Date Bargain, The Wedding Date is infinitely memorable. I absolutely adored this book which had so many of my favourite tropes that all played out beautifully. 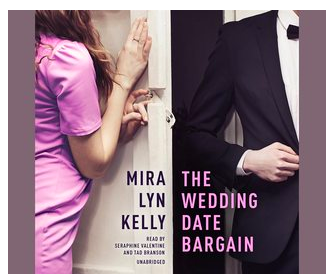 Where better to start than with the meet-cute “Stuck in a lift trope”*. This trope can both tank and soar and in this book, it is absolutely awesome. The dialogue just sparkles, the food begging is fun and it is such a great way for two people to get chatting and in this case, ending up with the hero Drew asking heroine Alexa to be his fake girlfriend (tropetastic!) at a wedding from hell. This weekend culminates with both Drew and Alexa getting on so well that they try to have a long distance relationship with both of them taking time to travel between Berkeley (near San Francisco) and Los Angeles over a series of weekends across many months. Drew is a paediatrician, and Alexa is a lawyer working for the Mayor. He is a white man and she is black. I loved the dynamic between the two of them and it reminded me of the gorgeous dynamic between Simon Baker and Sanaa Lathan in the wonderful movie Something New. I just loved how Guillory connects these two through their humour and sparkle – oh that “glitter of joy”!. I loved the texting, I really understood the pressures they felt at being apart and the difficulty of understanding the tone with which messages are sent and the problems that are inherent in long distance romance. Guillory addresses issues of race, comfort zones when it comes to being with new acquaintances and expectations of how someone might fit into a new group of people and she explores these issues with the lightness that is romance comedy which in my opinion is very hard to do well as it could easily slip into mockery/slapstick/pejorative writing. I also liked the reflections of how people can negotiate a new relationship especially with the added stress of distance. So few people can manage long distance romances, and it takes a lot of maturity on both sides to be able to sustain a relationship and this is something that falls apart for both Alexa and Drew especially in light of their long term issues around their lives that they both harbour. And yet, somehow, it all comes together again at the end. Not by some grand gesture and huge announcement, but just through Drew wanting to support Alexa on an issue that he knew was important to her even though they had broken up. Which brought them to mend their relationship and the ending of The Wedding Date was gorgeous and made me feel really happy and squishy schmaltzy with love love love. I am so happy that my 2019 romance reading started on such a high note. What a joy reading something that engages and uplifts! I want to read more for fun this year. I’m trying to stop being so engaged on the news after work, so I can devote more time to reading for pleasure.